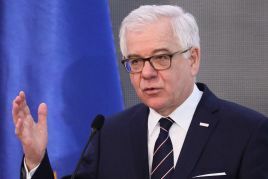 Poland's FM to visit Indonesia for first time in 21 years Poland's Foreign Minister Jacek Czaputowicz will travel to Indonesia on November 25-27. This will be the first visit of the Polish Foreign Minister to Indonesia in 21 years, the Ministry said on its website. Poland's Foreign Minister Jacek Czaputowicz will travel to Indonesia on November 25-27. This will be the first visit of the Polish Foreign Minister to Indonesia in 21 years, the Ministry said on its website. The visit, organised on the centenary of Poland regaining independence and the 20th anniversary of democracy in Indonesia, is to emphasise the growing importance of the Southeast Asian countries in Poland’s foreign policy. Indonesia is the largest country in the region and the fourth most populated country in the world, a member of ASEAN, APEC and G20, the Foreign Ministry noted. The programme of Mr Czaputowicz's visit includes bilateral talks with his Indonesian counterpart Retno Marsudi, meetings with the Sultan of Yogyakarta and the deputy secretary general of the Association of Southeast Asian Nations. The Polish and Indonesian foreign ministers are scheduled to discuss bilateral political, economic and educational cooperation, regional security issues, as well as guidelines for cooperation in the UN Security Council in 2019, when Poland and Indonesia will jointly be non-permanent members of the council. During the visit, Mr Czaputowicz will also meet with Polish and Indonesian businessmen and attend the official opening of the Polish Trade and Investment Agency's foreign office in Jakarta.